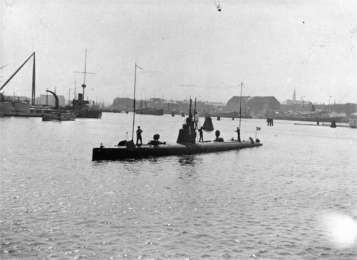 The submarine DYKKEREN in Copenhagen harbor. Sank during a submerged training exercise after a collision with a Norwegian steamer off Taarbaek Reef outside Copenhagen. During the training exercises in 1910 a performance test was held, and the sub stayed submerged for 12 hours. In the fall of 1910 the DYKKEREN was equipped with wireless communi-cation, thereby becoming one of the first subs in the world equipped with wireless. 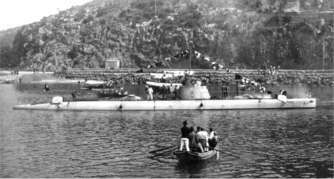 DYKKEREN immediately after launching at La Spezia in Italy, 1909.